What it is:A liquid eyeliner with an innovative brush tip for effortless, precise application. What it does:Achieve eye perfection with this high-pigment, waterproof liner that stays put all day for a fade-, melt-, crack-, and run-resistant finish. The superfine and flexible brush tip glides across the lashline for incredibly fluid application, allowing you to create a variety of looks with ease. Unlike traditional felt tip liners, this brush tip will not fray. What else you need to know:Tattoo Liner is completely free of animal-derived ingredients and is not tested on animals. 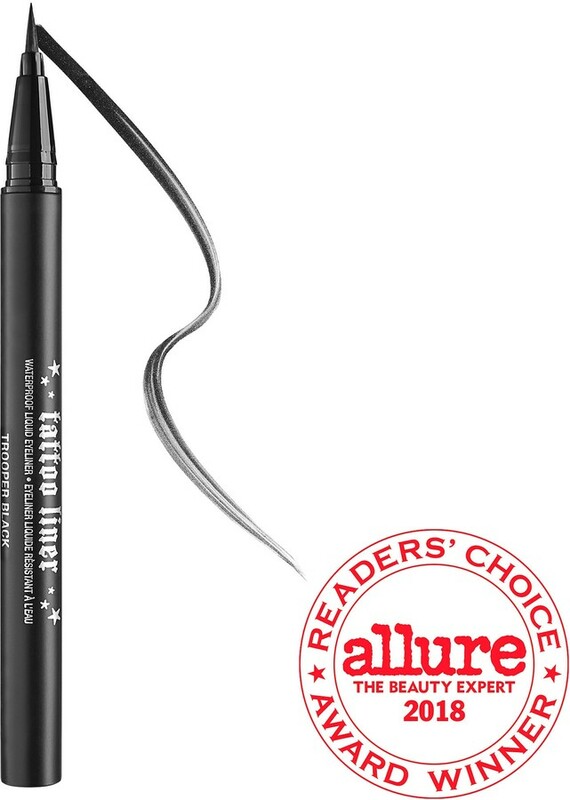 The Trooper shade is an Allure Reader’s Choice award winner. Suggested Usage: -For a subtle defining line, lightly drag the brush tip across the base of your lash line from the inner to the outer corner, pressing the brush as close to the lash roots as possible. -Use less pressure to create a thinner line and add more pressure to create a bolder line or continue to layer until you achieve desired definition. -For best results, wipe brush tip with a damp tissue before applying to prevent powder build-up, which may cause Tattoo Liner to dry out. Created by Kat Von D, tattoo artist, TV star, and owner of High Voltage Tattoo, this inspiring makeup collection exemplifies the fusion of glamorous, old Hollywood and edgy rock ‘n’ roll. Kat’s distinct style and flawlessly crafted face reveals that she is as masterful with a makeup brush as she is with a tattoo machine. Her passion for makeup and self-expression is inked into every product she creates, from the romantic, soulful designs to the rich, highly pigmented and long-lasting formulations. Exclusively at Sephora, Kat Von D’s one-of-a-kind beauty collection allows you to indulge your creativity and unleash your inner artist.